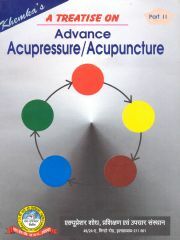 A Treatise on Advance Book Part -02 Book This is the second book of the 24-part epical Treatise series of books on acupressure/acupuncture written by the author. This book elaborates upon the various theories of treatment, in particular the five element theory as explained in Part I of the Treatise series. The book goes on to describe the famous eight guiding principles of treatment and the four factors of diagnosis as followed in Chinese acupressure/acupuncture therapy. There are 14 main meridians in the human body as per Chinese acupuncture system. Each of these meridians consists of varying number of points, making it a total of 361 points. Besides, a large number of extra points got discovered in China with the passage of time. The characteristic properties of each of these 361 points and the important extra points have been explained in this book. Each point by itself or in combination with other points is capable of treating a large number of ailments. All these are listed in great detail in this book.